The Swedish Author Steig Larsson wrote three crime novels, before he unexpectedly died in 2004. After his death, those novels were translated in English by Reg Keeland under the names of ‘The Girl with the Dragon Tattoo’, ‘The Girl who Played with Fire’ and ‘The Girl who kicked the Hornets’ Nest’. I had read ‘The Girl with the Dragon Tattoo’ yesterday, and despite some of the heart-breaking, gory scenes, I liked the mystery and decided to check out Larsson’s next offering. 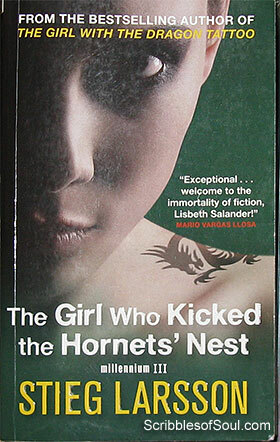 Due to some misunderstanding, I ended up reading the last book of the Trilogy, ‘The Girl who Kicked the Hornets’ Nest’ instead of the second one. This mistake cost me first 100 pages of this novel, as in that period, the story is simply carried on from the previous book, and I could not make any connection to the murder and crimes that have led to the circumstances projected in the last book. However, after the initial awkwardness, Steig’s brilliance won me over and the story started making sense. If the first book had Michael Blomkvist as the main protagonist, here the limelight shifts to Lisbeth Salander, who is suspected of three murders, and is fighting for her own life in a Hospital. Somehow the Security police Sapo is responsible for all the miseries of Salander and is hell bent on declaring her mentally retarded. The novel with its 743 pages long narrative solves the mystery of Salander’s extraordinary life and her struggle against society and authorities to prove her competence. I think this book is much more well written than the first one and depends on the unusual circumstances, rather than the sensational crimes to hold one’s attention. The strory that started as tattered fragments, is slowly and deftly transformed into a beautiful piece, with all the loose ends tied and embellished with Advocate Giannini’s brilliance. I found the swan song of Steig Larsson thoroughly entertaining. I just wish that he was alive and could produce another such good crime novel from his kitty.